Last Saturday, in an event following the main Spring Weekend concert at Koeppel Ice Rink, the Mill hosted “Spring Freakend.” The show featured three bands that performed on a large outdoor stage behind the Mill. The first band to perform was longtime Mill standby Wooly Mammoths. The band that was once the “hometown band” of Connor Kennedy ’16 has carved out a niche at the Mill. Their performance lasted scarcely longer than a half hour, but the dancing rhythms of their song choices were the perfect way for the crowd to start moving at the beginning of the show. Though many in the crowd were not very familiar with the Band’s own songs, or the deeper cuts by bands like LCD Soundsystem, the energy brought by the Mammoths was electric. The next band to take the stage was Diet Cig. The two-person band is fronted by Alex Luciano on guitar/vocals and Noah Bowman on drums. Luciano, who had a pixie haircut and glitter makeup started the set by announcing that their show was a “safer space” and that audience members should ask permission before touching people. The group then performed a dreamy set of songs from their EP “Overeasy” and their most recent album “Swear I’m Good at This.” Though Diet Cig performed several beautiful, reverberating songs, they didn’t quite match the all-out sprint of the Wooly Mammoths when they started the show. Luciano finished the set with an attempt crowd surfing. Finally, Philadelphia and Brooklyn based band “Vacationer” took the stage. As the nominal headliner it was this band that was most difficult for the Mill to book. 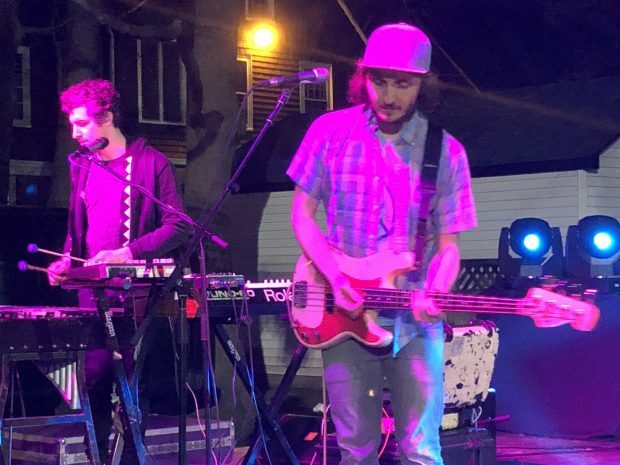 Fronted by Kenny Vasoli, the band started off with a return to the style of hypnotic synth-pop that had opened the show. Ryan Zimmaro’s drumming and Michael Mullin’s looping keyboard riffs and experimentations made every song in the set feel special in its own way. All three of these bands were well received by Trinity students, and considered to be well suited for later in the evening on Friday. The great success of Wooly Mammoths cannot be overlooked though. Of the three bands, they were certainly considered to be the least elite, but they provided the most consistently powerful songs and were certainly the most “danceable” act of the evening.